While I previously went through a two-year period of vegetarianism when I last lived on Vancouver Island, I had long been a big fan of meat. I loved eating it, cooking with it, creating new recipes with it, smelling it as it baked or broiled or barbecued. April 12, 2009 was the last time I ate meat. A little over three months without meat seems like a short time for most and, while some may doubt the genuine intent behind my decision to cut meat entirely from my diet, that time is irrelevant. I’m still new to this “vegetarian thing” and know that there’s still a lot to learn. I’m constantly educating myself, researching the lifestyle I’ve undertaken and finding new recipes and ways at which to keep myself healthy without eating meat. My choice didn’t come about because I decided it suddenly tasted “gross”. In fact, my diet still includes eggs and dairy products from humanely-obtained local sources. With so many questions being bounced around between my family, my friends and even my blog readers, I’ve felt the time is right to deliver my vegetarian’s manifesto, if you will. I can’t necessarily pinpoint the “how” but I can definitely articulate and expand on the “why”. It’s no secret that I’ve long been a lover of animals. This includes everything from cats to dogs to chickens to birds to whales and every other living, breathing creature under the sun. To me, they have always been beautiful, abundant and gentle beings, each possessing somewhat of an innocence that we humans dropped along the way at some point. What was missing in my own life in this regard was a connection. There was no particular incident that spurred on my decision to shed animals from my diet, my make-up bag or my closet. I know that I can honestly say that, although it may have been an idea floating in the furthest reaches of my subconscious, I truly did wake up one day and realized my perception had changed entirely. It was Easter Sunday and my mom was out of town, so my aunt and I were left to our own devices for dinner. Rather than cooking a large turkey for the two of us, I found a recipe for Cornish game hens and planned for that instead. Easter Sunday was also the day I decided I was done. I carefully prepared the meal, as well as the vegetables to go along with it, and then sat at the dinner table with my aunt that evening. “Today is the last day I’m going to eat meat,” I told her without batting an eyelash. It was simply that matter-of-fact. What caused that connection or that proverbial light bulb to illuminate is beyond me, but perhaps it was simply an inevitable culmination of my personal beliefs. If I love animals as much as I purport to, then why do I have no problem at all throwing parts of their carcasses on a grill or in a pan and proceed to devour them? This is where the problem lies: animals are living, humourous, loving, emotional, intelligent beings that eat, breathe, sleep, feel, think and move. Food, on the other hand, is completely inanimate. A hot dog just sits on your plate without movement or sound. The only thing meat will do if you leave it long enough is decay. But making the connection between the living and the non-living isn’t easy. What joins the two usually involves a sharp blade, inhumane treatment and much pain. It isn’t my endeavour to shock each of you through facts or unbelievably disturbing details of how the animals make it from the farm to the plate. Many of you have seen the PETA videos while others still may have witnessed it first-hand. It’s my belief, as a woman and an individual human being, that we are all here on the planet by the design of something greater than all of us. Animals have personalities and feel, experience and understand many of the same quotients and emotions we humans do. If you have met Jordy, you know what I’m talking about! We are all species and none of us can say that one is greater than the other. Animals feel physical pain, experience the emotion of fear and feel the natural urge to flee when threatened just as you or I do. Something as simple as a backyard BBQ with family is deemed more valuable than the life of the pig whose ribs are being devoured. Dispute that if you will, but actions always speak volumes above words. Last month, an Oklahoma woman and her friend were charged with killing and skinning a seven-week-old puppy with the intent to make a belt [source]. While the community was outraged, I couldn’t help but wonder how this was deemed to be a “despicable” case of animal cruelty, yet if the belt had been made of a cow, it would be okay. Something doesn’t add up. I’ve heard a million arguments made to justify the consumption of meat. While some will say that the production of meat is actually good for the environment and the economy, others still will tell tales of the astronomical impact it has on the global environment. The point can also be attempted that eating vegetables is also killing living things, but it is scientific fact that plants do not possess both the central nervous system and brain required to feel and register pain [source]. But instead of respecting these beings, we assume we own them by locking them up in zoos, keeping them confined to large tanks at city aquariums and corralling them until they’re ripe for slaughter. All of that is besides my point. The irony is that humans take such pride in being a group of beings so incredibly evolved as a species that our lives are seemingly worth more than those of animals. Yet, we rely on the idea that eating meat is our primitive right. The truth about us humans is that yes – we are evolved; so much so that we no are longer required to consume meat to ensure a balanced diet and live a healthy and wholesome lifestyle. While at one point in time, eating meat and testing on animals may have been essential, it’s no longer necessary. Technology has moved us past that, and the choice to eat an animal is no longer premised on a need but instead on desire. Very recently, I was discussing the beauty and gentle nature of cows with someone close to me. 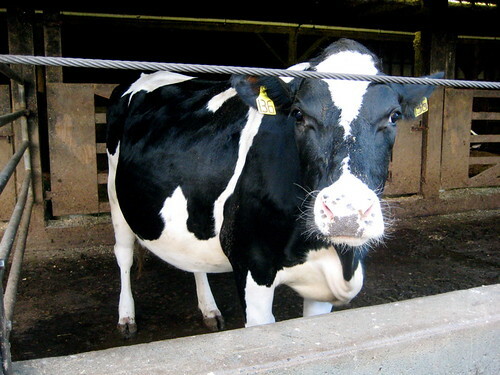 “I love cows too but I could never look one in the eyes – I’d just feel too guilty!” was what they told me. That, right there, is precisely the reason for my choice. I can no longer look at what is literally staring me in the face and deny it any longer. I have made a decision and declaration to live a vegetarian lifestyle. I now make every single effort possible to use products that have not been tested on animals. No longer will items purchased for my wardrobe be made of leather products. By making these choices I am not claiming to be perfect, just as I do not attempt to describe those that eat meat as imperfect. However, no matter what kind of argument anyone attempts to make against my choice, there can be no argument against compassion. There can be no argument against equality or love. I believe that every living being, whether toes, heels or hooves, has the exact same right to live a normal, happy and healthy life. In 2007, Academy Award winner (and bonafide babe) Joaquin Phoenix passionately contributed to a film called Earthlings. It is as incredible as it is intense. In it, he points out the direct correlation between all of the Earth’s species and their individual values. While containing compiled videos that are not isolated events, but instead the norm, Earthlings is perhaps the most violent and graphic film you will ever see. Except it’s real. Earthlings can be viewed online in its entirety here. Comments and contributions to the discussion are both welcome and encouraged. In doing so, pleasure ensure that you’ve read this article in its entirety before doing so. All opinions are to be respected, and comments of a belligerent or abusive nature will be deleted after the IP address is flagged. I often lean towards the idea of vegetarianism too, the truth is i would just rather eat delicious savory vegetables and noodles and not a big piece of meat! Our society eats WAY too much meat and it just isn’t how our bodies were intended to be treated! It also just isn’t ethical to eat a ton of meat. All of the grains/water/vegetables that it takes to make one steak is slightly crazy! When we could be feeding so many people with all of those basic ingredients! Now if only PETA employees could show humans as much courtesy as they do animals/fish/flies and stop comparing animal slaughtering to human slaughtering than maybe they would make more of an impact on our world! @Ashely – I can’t argue with PETA’s comparison between animal slaughter and human slaughtering. In my own opinion, killing is killing and no one can judge which life is worth more. That in itself is the reason I choose not to eat animals. As I stated above, animals have all of the some inclinations, feelings, emotions and pain sensors as we do, so any kind of slaughter is slaughter. I don’t think PETA is trying to be discourteous in their attempts, but society has become too desensitized to where their meals come from that a drastic approach is the only way in which they can get the attention of people. After this I have never really thought about the being a vegetarian part that not only would not eat animals raise for food, but also not using clothing and various other things that are created with the use of animals be it from them, or tested on them. Will you still be eating things such as eggs, or milk? Or more of the vegan way (if i am thinking correctly) and choose not to eat the by-product of an animal? again such as eggs/milk etc? As for humans evolving not to eat meat, if we truly were not meant to eat meat would we not have teeth like that of a cow? We would have no use for incisors etc? Or do you mean we are able to get our nutrients (such as protein) by other means such as beans etc and not from meat? I’m all for saving/protecting various animals, but I guess I have not really thought about the farm raised animals such as cows/cattle, chickens, pigs etc. @Tyler – As stated above, I do still eat eggs and dairy products, but only from farms that employ humane practices. Many of these farms I have visited first-hand to ensure that the animals are being treated with respect. As for incisors, that’s definitely an age-old debate in this regard. Evolution has given us incisors and perhaps at one time it was intended for us to eat meat. However, as I said, we as the human society have evolved and technology in the area of food has caught up with the 21st century. The simple fact of the matter is that we don’t need to eat meat, regardless of our own beliefs around the subject and regardless of the teeth we have, to ensure a healthy and balanced diet. That said, in my opinion to eat an animal is a desire, not an essential. Protein can be found in leafy greens (such as spinach), soy products, nuts, cheese, eggs, beans, seeds, peanut butter, chick peas and so much more. I saw “Food Inc” last week at 5th Avenue Cinema. It is based on the books “Fast Food Nation” and “The Omnivore’s Dilemma”. I wish that it were required watching, and that people who watched it (and therefore learned a little bit more about where their food comes from, and what it is made out of) would take that knowledge and make better choices about the food they eat. It’s not easy watching, but it is reality. I have been a piscavorian for around 15 years and as I learned more about fisheries and fish stocks I have made the choice to go vegetarian. It just feels right to eat local and organic. Sadly there are still places that do not have the option of whether or not their chicken was shoved in a cage with a thousand others. It is coming around though, slowly but surely. I don’t think I can be as committed as you are regarding eating meat but I have cut down considerably. No meat for breakfast or lunch and at least 2 or 3 dinners a week are meat free. I have seen Earthlings and I can’t say it didn’t leave an impression. It is getting harder to swallow a piece of steak without thinking of where it came from. I commend you for taking a stance for what you believe and following through with it. I haven’t had red meat in, oh, well since grade four, and no poultry for the last five years and I don’t miss it a bit. I stopped eating dairy over a year ago-but baby craves it so like you said, only from organic local and humane sources. I feel so good every meal knowing that I can enjoy every bit because nothing had to suffer for my dinner. Except all the dumb, well how you you think the carrots feel, they are living too, comments. Urgh. Seriously! Quick question that’s a little off-topic from the previous comments. I know you’ve mentioned on your blog in recent months that you’re also making positive changes in your life in terms of setting your budget and setting some financial goals. I know meat isn’t exactly cheap money-wise either, but I’ve heard from different friends who live a veggie lifestyle that it can get pretty expensive. Are you finding any strain with your budget in putting together balanced vegetarian meals at home? Just curious because I’d like to incorporate more vegetarian meals into my own diet. I’m pretty sure we’re both in about the same place in life from various things you’ve mentioned in previous posts (decent job, late twenties, single) and I’m wondering how you’re finding buying all veggie friendly foods is affecting your budget if at all. I feel exactly the same…I think once you make that emotional connection between what you’re consuming and the horrible reality of where it comes from, it’s difficult to ever go back. I’ve known chickens with great senses of humour, dogs who are unabashed loving, and affectionate horses….they are individual “persons”, and every single one of them deserves the same appreciation as we do. Not as a means to an end, but because each of them is a life with inherent value. YOU are my amazing, funny, compassionate, intelligent, caring, earth-mother loving friend…and now are the animals hero. They LOVE you and of course so do I, even the carrotts. We are WOWED. And P.S. Earthlings should become school curriculum. If you’re interested, you might want to check out Michael Pollan’s “The Omnivore’s Dilemma.” I’m about 12 hours in on audiobook (out of 15) and it’s been fascinating – aside from his look at the dubious practices of large-scale commercial farming, he explores the ethics of vegetarianism as well. He describes the example of a particular organic, free range farm (Polyface farm) which utilizes productive links between waste and food cycles of cows and chickens, and quite graphically describes both an organic farm abbatoir (slaughterhouse) and a industrial-scale slaughterhouse. This is not the “certified organic” farm which has one window open to the outside in a room full of chickens, either: this is describing chickens which graze outside eating the grubs found in cow dung. I’m sure vegetarians and meat eaters will take away what they will from the book – either a desire to become vegetarian after being faced with the reality of killing animals (which he does not shy away from in the least), or a conviction that it’s ok to eat meat, but you better know where the hell it’s coming from, how it lived and how it died if you want to consider it at all “ethical.” At any rate it’s a worthwhile book that educates the consumer about all food, animal and vegetable, and its source. Hey Keira, first time commenter, long time reader. Just wanted to say that this was a great post! I chose to become a vegetarian just over 3 months ago as well (April 14). Like many of the commenters on here, I used to think I could never give up meat. I *loved* the taste too much and felt like I was doing well because I would have a couple veggie meals a week and I tried to keep things as organic as possible (which was not possible 100% of the time, though I did eat mostly organic meats). I realized though that liking the taste of meat and pretty much being afraid that I couldn’t be happy as a vegetarian were not good enough reasons to keep eating meat when compared to the three HUGE reasons for becoming vegetarian – my health, the environment and no longer participating in the cruelty the animals I ate faced. After 3 months, I know I still have a lot to learn and a lot of new foods to try, and that’s really exciting! This was one of the best decisions I’ve ever made! I think one of the hardest parts has been other people. Non-vegetarians don’t want to discuss the health, or any other, benefits of vegetarianism too deeply. I think most see it as an indirect attack/judgment on their way of living, even though I don’t feel that way. I’ve never grilled (no pun intended) anyone on why they eat meat, but I’ve sure be asked to answer a bunch of intrusive, uninformed, annoyed (them, not me) and judgmental questions about why I know longer eat meat. It doesn’t really bother me though, I don’t mind arguing for my beliefs and if the other person is dead set against them, it’s all the most interesting!